Fellow readers/ viewers, meet Viola Atumanyire who was born at 7 months. 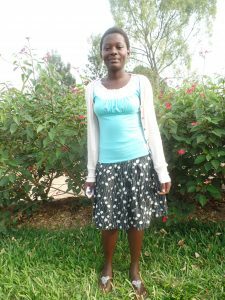 Viola aged 17 is born in a family of 2 children though the mother had two miscarriages before giving birth to her at only 7 months. Viola stays with the mother who is H.I.V positive. She lost a father due to H.I.V AIDS in 2004 when she was 4 years old and was left with her young brother who was 2 years together with their ailing mother. 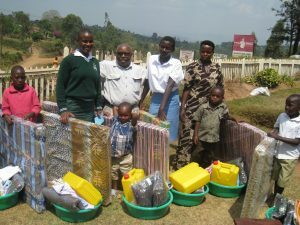 Through support from well wishers, she was able to complete Primary Seven (P.7) where she got 7 aggregates (1st grade) and was able to join Secondary School but not of her choice due to financial constraints in her family. 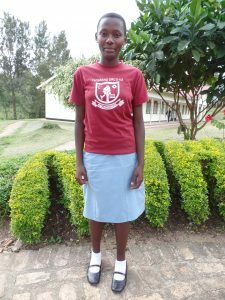 With the help of good Samaritans and teachers at school because of her good academic performance, she was able to finish S.2 and her hopes of becoming an accountant were put to test as she almost dropped out of school. Mosaic Vision Ministries intervenes, In 2014, with the help of TASO (The AIDS Support Organization) a Non Governmental Organization and head teacher of her former school (Kinyasano Girls High School), she was recommended for sponsorship and was able to complete S.4 where she emerged as the best performing student both at her school and attained the only First grade that Mosaic Vision Ministries registered this year. Mosaic Vision Ministries Supervisor Mr. Jacques Masiko with Viola after receiving beddings from Mosaic Vision Ministries. Viola with her friend Olivia who is also sponsored by Mosaic. She is currently at Immaculate Heart Girls High School (a school she was admitted at after finishing P.7 but couldn’t join due to financial constraints and is doing Mathematics Economic and Geography /ICT and says that her dream career is to become an Accountant. She thanks God for the far He has brought her and Mosaic Vision Ministries for all it has done for her. Join us in restoring the lives of AIDS orphans all year long. 100% of donations go directly to orphans in need.